How can Witchcraft be understood from a Traditional point of view? This question demands a clarification of terms, namely what is witchcraft and what does the term traditional entails. To begin with the latter, tradition, it is given many odd interpretations, quite commonly speaking of its arcane heredity, spoken of in purely linear and modern-historical ways. This means that our modern world view tends to impose hegemony between oppositions aiming towards consensus that are not necessarily true, but rather reflects an alliance generated by contemporary discourse. This should tell us that modern terms do tend to be fragile, as all discourse are by nature fragile and volatile – subject for discursive change as they are. The fragmentation of truth into personal opinion and the social struggle between opposition in order to reach truth testifies to the difficulty of discovering what is really in a name, a term and a concept. Because today truth is signified by agreement, not by a discovery of what is. Truth is as Plato said what is beautiful and good. If we adopt these adjectives as proper it means that the truth must be both beautiful – and good. Plato understood what is good both to be rationally appealing as well as leading to a sensation of what we might call love to flow outwards, being embracing. It is here the beautiful enters. The affirmation of beauty validates the rational idea. The logic is simple; if your truth generates malice it is a lie. There are various kinds of malice, ranging from the born a again Christian who see himself as saved but all other as condemned to the Satanic hedonist who sees himself as the be all and end all of everything are from this perspective on the same scale. This tells us that these avenues of belief can never be traditional due to its level of sourness. Quite simply, a traditional world view focuses on the One and sees all other as radiations of the One. We speak of a monism that rejects antagonism to be a part of its mystery. In simple words, we are speaking of a certain order, well replicated in the often used metaphor and allegory of the golden chain that stretches from the throne of the One to the murkiest quarters of matter. It means that all there is, IS because of the One. It is the divine essence perforating everything – but along a golden chain that speaks of distance from the throne. This distance tends to be infused with moral judgments, but a moral resting on an ethic that places not man, the generation, but man, the individual in the position of the judge. From this position several acts, drives and preferences turn into a measurement claiming validity greater than its constitution. This distance separates the kingdoms from each other, but this do not speak automatically about quality on a scale measuring good from bad. What we have is a succession of openness that opens for impurities that in last instant speaks of the kingdom above. The kingdom of plants is usually seen as the most inferior. But in every plant rests its star. So, good and bad does not speak of distance, but more of a posture. And in this we find the idea of sin, to forfeit your goal. Again, we see how moral judgments clouded tradition, as today ‘sin’ is understood as something bad we do, no matter who we are and what our destiny might be. If we see creation as a web of interrelations where the challenge is to realize where the pieces belong we are more close to the truth than any condemnation. This means quite soberly that something traditional is indeed handed down through generations, material or spiritual, but in a spirit of truth, which means it has to be good and beautiful. The goodness and beauty of traditions becomes its mark of being genuine. If we then accept this presentation of tradition, where do we place witchcraft? Again, the question poses a demand for clarification. The Craft of the Witch; what is a Witch and what is a Craft? Again we are faced with labels imposed upon the subject, but nevertheless what are the contents in the European perception of the Witch? It is of someone secluded from the ‘civilis,' someone considered to have a greater insight into the secret works of nature and the ability to cure and curse. Secrecy and the sensual walks hand in hand with solitude and the ghoulish. We are speaking of the great contrast arising from the mastery of the left hand and the right hand. A mastery impossible to have if one is not aligned with the axis stretching to the Polar North. From this perspective the Witch turns into a votary of Venus, daughter of the Sun, and the Craft is the field of fertility, ranging from the growth of crops to the growth of wisdom. Its terrain is the countryside, the wild kingdoms of woods and lakes, rivers and mountains. In her hands lovely Venus holds a promise of honest ascent and the seeds of corruption, as spoken of in the poetic imagery that has coloured the nocturnal history of mankind. 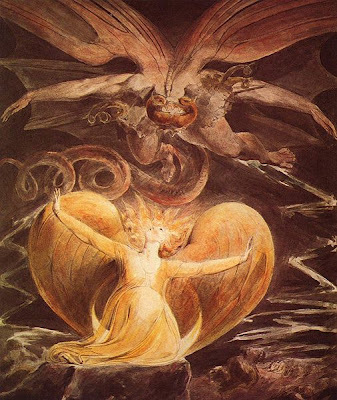 The Art of Venus is the gift of magia naturalis, her venom being the challenge that rests in power and dominion. It is from here we have the roots of the Witch as the vigilant watcher of the course of divine essence and its unfolding in spirit and matter and the counter-productive ‘maleficus’ who rage against world and nature, dislocated and consumed by his own ‘nafs’ and inferior inclinations that invites the illusion of matter being superior to spirit, the manifest being superior to its un-manifest and infinite possibilities. And herein is found the division born by accepting the illusion of matter being essentially different from its origin. This is the first juncture on the path, where we find Janus Bifrons opening for two avenues - and here is found the Craft proper and its pale and atrocious mimic, its inversion. Chose ye well, the steps on the road.